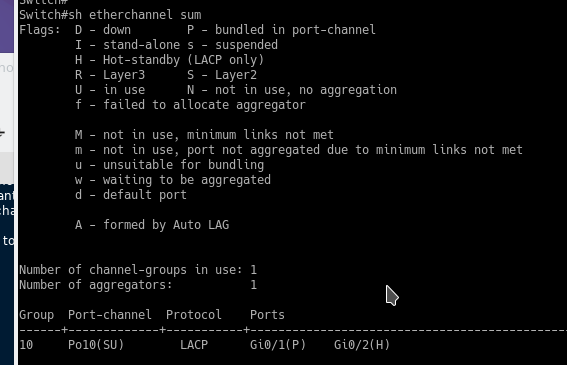 When configuring a channel group we have the options of LACP, PAGP, or just ON (static). Note2: You should be aware the active/passive values do not affect LACP master elections. Note3: LACP has a max active link limitation of 8 links, but you can have up to 16 in a bundle as stand by with no special configuration needed. What negotiations will work successfully for LACP? What negotiations will work successfully for PAGP? What issues can happen if you have one side as “on” while the other side is not? If we had STP running the port would show up as P2p Dispute (best case), sometimes a loop here is still possible. If you were not running STP and messed up the static etherchannel a loop is guaranteed. 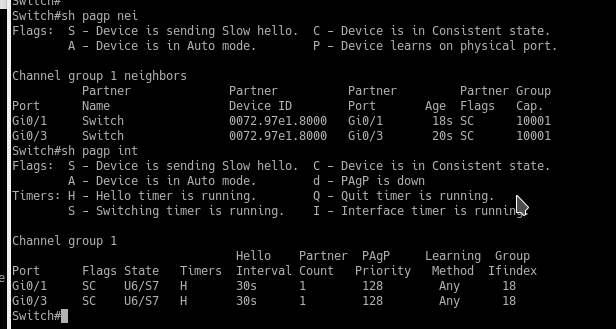 Show spanning-tree should also show the port-channel interface instead of the port members. Also any mac address learned on either port-channel member is associated to the port-channel interface. Once formed, LACP has a keep alive of 30 seconds. Each side will send their keepalives no matter if their role is active or passive. See the below screenshot for proof, each color is a different sender. The second column is the seconds. LACP is encapsulated in Ethernet II/DIX and NOT 802.3 Ethernet. Thus its ethertype is 0x8809. LACP is special in that it uses a system ID (like STP) and a port priority for electing a master. The LACP system ID is the priority + the switch mac address, so there will never be a tie. The default LACP system ID is 32768, and lower is better in this case. The default Port Priority is also 32768. Let’s see what happens when we just put them all in one LACP etherchannel. note: changing this requires bouncing the port-channel up and down. Let’s take the above topology and use it in our example to explain this. 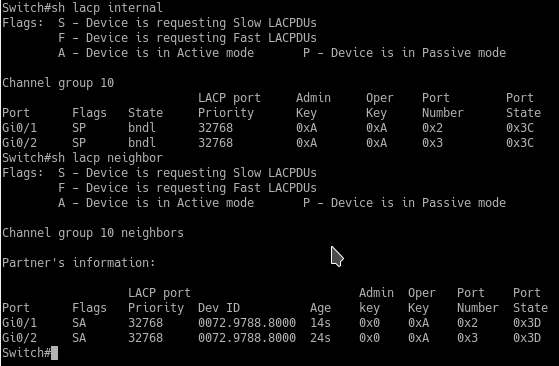 Basically LACP fast-switchover is utilizing LACP for an active and standby link (by default it’s active active). I believe the only time you would want to do this is if somehow the load balancing was not favoring the application correctly, or you were having issues with the traffic/flows being hashed. 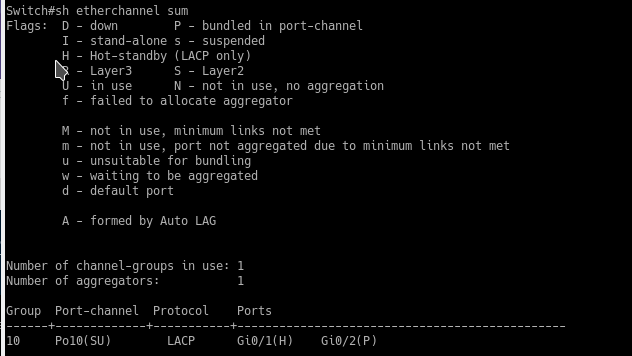 This gives you the redundancy of LACP (without utilizing the redundancy of STP) in an active stand by pair. This fast-switchover commands basically let’s us recover an active/ standby link faster than just having the max-bundle 1 command, if we just had max-bundle in the config, the port-channel would flap and take longer to recover. Now you don’t necessarily NEED to config system-priority nor port-priority if you don’t care which link is active, but most likely you do. we also want G0/1 to be the active link. Then we want to change it over to G0/2 and see what happens. Before we do that let’s configure these links, first we want to use the max-bundle command to limit the max active links to 1, then we enable lacp fast-switchover to enable active standby. So the switch that gets to make these decisions is the LACP master, so let’s set our priority on SW2 after we configure it. 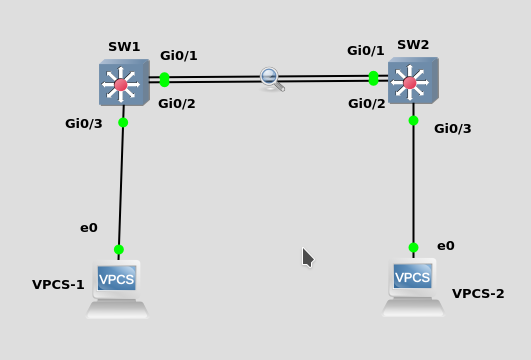 Now we configured SW2 to be the LACP master, and it will now choose which port becomes standby. Finally we selected g0/1 as the active link so we set it’s priority to 0. Notice above we see that G0/2 is stand by now because we select G0/1 as the lower priority? Now let’s make G0/2 the active one. Wait a few seconds for LACP messages to go out and renegotiate the link then run “show etherchannel sum” again. Notice now G0/2 is active.